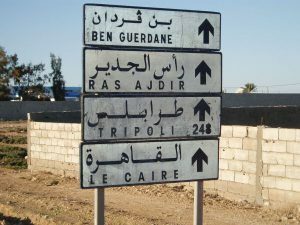 Smuggling of fuel across the Libyan-Tunisian border is rife and in full view of officials on both sides (Photo: Archives by Houda Mzioudet / Libya Herald). Rampant fuel trafficking across the Libyan-Tunisian frontier continues unabated amid a dearth of petrol supplies in the western city of Zuwara. Only nine out of 40 petrol stations in the municipality are functioning, though they often go days at a time without being replenished. Even when they are stocked up, supplies quickly evaporate as long lines of cars build up hoping to strike lucky. At the Ras Jedir border, in one hour alone over a hundred beaten up Tunisian vans crossed into Libya to buy cheap petrol. Some did not even have engines and were towed by the car in front, but it didn’t matter so long as they could fill up with fuel. All of this happened under the eyes of officials on either side. One Tunisian, who gave his profession as an “international businessmen dealing with trade across the border,” said petrol dealers sold tanker-loads of fuel that came from the refinery in Zawia. He also claimed the few petrol stations open in Zuwara and neighbouring areas were complicit. “It costs between one to two Libyan Dinars a litre (half to one Tunisian Dinar). In Tunisia they then sell a litre at 1.20 Tunisian Dinars in Ben Guerdane,” he said. The official Tunisian price is hovering at around 1.80 Tunisian Dinars a litre at the moment. Lining the streets of the scruffy Tunisian border town of Ben Guerdane were 70-80 stalls selling containers of the smuggled petrol. Despite some operating within view of the National Guard, locals said security dared not intervene over fears that riots could take place – a common occurrence in the lawless, Wild-West-like town. In Ben Guerdane’s market, a chaotic, dusty strip of road provides a place for carpets, washing machines and, of course, petrol to be sold. Yet on the outskirts high walled, security camera-equipped mansions loom with their sprawling gardens. “These are the people profiting from smuggling,” one local said. Smuggling fuel is illegal and Zuwara’s municipality security chief Colonel Aymed Absa said his team had worked hard to clamp down on the trade. The issue lies in a legal loophole. Absa’s team regularly announce the seizure of containers with fuel intended to be trafficked. However, smugglers fit two extra-large tanks capable of taking between 400 and 1,000 litres in their car. When officials check the vehicles, on the surface nothing is amiss. Tunisian authorities have sought to crackdown on the smuggling of goods in the past, leading to closures at the border, but petrol is still getting through. Custom officials seemed more concerned that large amounts of dollars or bottles of whiskey could be brought in. It appears those driving these cars loaded with fuel were not the biggest beneficiaries of the trade. Most appeared relatively poor. A resident of Zuwara said that for those not involved in smuggling, petrol cost around 0.15 Libyan Dinars a litre. “When there is petrol, we always take as much as we can. Even if some people don’t have an empty tank, they know they can potentially sell it to smugglers for a profit,” she said. “It’s a difficult balancing act. Do you risk running out of fuel because it always runs out, or make a little bit of money knowing the bank wont have any cash either,” she added.